The European Union, eight other European countries and five Latin American nations were scheduled to meet in the Uruguayan capital with the goal of creating conditions for a peaceful political process, according to a European diplomatic source. An international meeting to negotiate a solution to the Venezuelan crisis opened Thursday in Montevideo as President Nicolás Maduro and opposition leader Juan Guaidó sparred over allowing humanitarian aid into the crisis-wracked country. The initiative, originally launched by Mexico and Uruguay as a "neutral countries" conference on Venezuela, has evolved into a meeting of a "Contact Group" launched by the EU in late January, and joined by Costa Rica, Bolivia and Ecuador. On Wednesday, Maduro – having rejected an EU ultimatum on organising snap presidential elections – welcomed the meeting and expressed support for "all steps and initiatives to facilitate dialogue". But Guaidó, who on January 23 declared himself Venezuela's interim president and is now recognised by 40 countries, has strongly rejected any talks with the government, dismissing it as a way for Maduro to buy time. "The opposition ... will not lend itself to any kind of false dialogue," he reiterated Wednesday. The same day, Guaidó had warned the Army of its responsibilities after soldiers blocked a key border bridge, sparking angry demands from the United States to allow desperately needed humanitarian aid to enter the country. Venezuela's Army had to choose between "a dictatorship that does not have an iota of humanity, or to side with the Constitution" from which he takes his legitimacy, Guaidó said in an interview on Colombian radio. US Secretary of State Mike Pompeo said Venezuela's military was deliberately blocking the aid "under Maduro's orders." Washington has pledged US$20 million in aid, while Canada has pledged US$40 million and the EU US$7.5 million. Maduro, who is supported by Russia, China, Turkey, Cuba and Iran, has refused all humanitarian aid shipments to Venezuela, which he says would open the way to allow a US military invasion. The 56-year-old has repeatedly accused the United States of fomenting a coup. He dismissed the need for aid on Wednesday as a "political show." "Imperialism does not help anyone in the world," he told Russia Today. But while tensions remained at a peak, participants in Thursday's meeting intended to "find a way between" the positions of US President Donald Trump and Russia's Vladimir Putin, Turkey's Recep Tayyip Erdogan and others, an EU source told AFP. 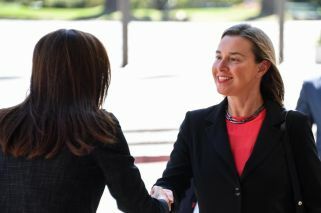 It is "not easy", added the source, whose delegation will be led by EU diplomacy chief Federica Mogherini. Even around the negotiating table, views are divided. On Wednesday, ahead of the meeting, Uruguay and Mexico – among the few Latin American countries that did not recognise Guaidó – proposed a dialogue without pre-conditions. "If we demand elections at this time, we impose conditions that make dialogue difficult," Uruguayan Foreign Minister Rodolfo Nin Novoa said in a joint statement of the two governments. Meanwhile, among the Europeans, France, Germany, Britain, the Netherlands, Portugal, Spain and Sweden are among the 21 out of 28 EU member states that officially support Guaidó. Italy has not done so. Mexico agreed to attend the meeting, but did not wish to formally join the Contact Group. Above all, the EU diplomatic source told AFP the meeting was about agreeing on "working methods." Meanwhile, 35-year-old National Assembly chief Guaidó has continued to ramp up pressure on the regime with a series of mass protests, the next of which is scheduled for February 12. His fledgling alternative administration will hold talks in Washington on February 14 on responding to "the largest hemispheric humanitarian crisis in modern history."